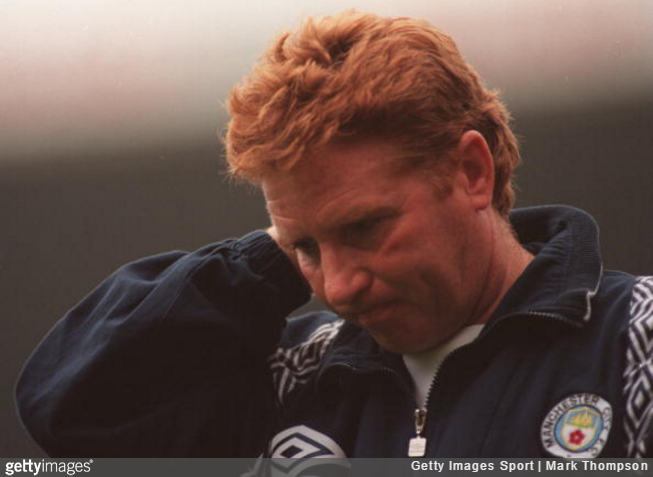 ‘Twas on this day in 1996 that Man City manager Alan Ball suffered a fateful instance of nominative determinism by dropping a bollock so dense and decisive that it ultimately saw his side jettisoned from what was then known as the Premiership. Having left Southampton in slightly acrimonious circumstances to take over at City the summer previous, cruel fate subsequently ensured that Ball found himself vying against his old team as the 1995/96 relegation battle went down to the wire. With only one relegation spot still to be decided going into the final match of the campaign, City played host to Liverpool while the Saints faced Wimbledon – both sides chasing vital victories. Alas, it took less than five minutes for Liverpool to go ahead when Steve Lomas had the misfortune to deflect a Steve McManaman cross into his own net. Ian Rush then put the Reds two up before goals from Uwe Rosler and Kit Symons clawed City back into the reckoning. However, Ball then needlessly injected an overdose of confusion into the maelstrom by incorrectly informing Lomas that Southampton were losing and that a draw would be enough to keep City up, thus prompting the midfielder to dribble the ball into the corner in an effort to wind down the clock. In actuality, the match at the Dell was still goalless as Niall Quinn, who had just been subbed off, quickly realised when he checked the live scores on a television in the tunnel. With Southampton looking set to snaffle a point, it instantly re-dawned on City that only a win would be enough to stave off the drop. Sadly, by that point, it was already too late – the game ended 2-2 and squeaky Ball and his leaky City side were consigned to their fate. It’s fair to say I don’t have good memories of last-day scenarios. The situation with City was just one of those things. Alan Ball, God rest his soul, told us a draw was enough to keep us up. If it wasn’t so serious there was great comic value in seeing big Niall running half-dressed down the touchline to say a draw WASN’T enough. It’s the quickest I had ever seen Niall run! He told us we needed to win so it was just crazy. Alan had received false information because he thought Southampton were losing and I was taking the ball into the corner flag to kill time. It was tough because just a week earlier I had scored the winner away to Aston Villa to keep us in the hunt. Relegation is hard enough anyway but under those circumstances it was so hard to take. I’d been at the club from the age of 12 so it was particularly hard on me. For the record, despite being relegated to Division One, City’s top brass decided against sacking Ball only for him to resign three matches into the following season. Sure enough, it wasn’t long before the club found themselves further demoted to the third tier (for the first time ever) thanks to a truly iconic scintilla of shite from Jamie Pollock. Although I agree that it wasn’t his finest moment, a little respect please, as the great Alan Ball is no longer with us. Safe to say that City are unlikely to ever be in this situation again.